The Modelling News: Read n’ Reviewed: "Landscapes of War. 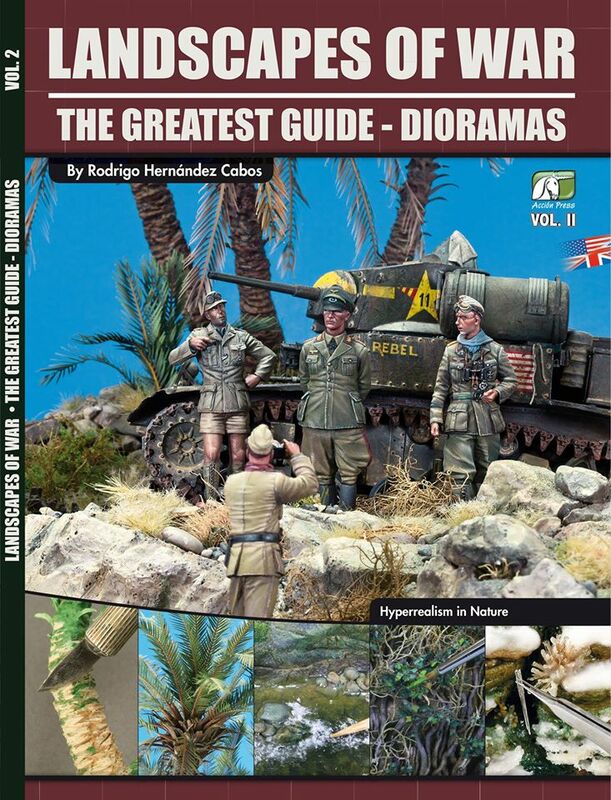 Diorama Vol.II" - Greatest Guide series. This book is bigger than volume I – (200 pages instead of 112) and it features the same layout as we have seen in the previous title, a glossy softcover in A4 portrait format. The covers have a little gatefold that contains the editors and the author’s notes on them. The inside pages are pretty glossy as well. Thicker than a magazine so there are no worries about seeing through any pages. The book is a little heavier than its sister companion volume understandably because of the extra pages, but it also costs double that of the first book because of the 90% extra book you get. Fair enough I suppose. A word about the concept, Mr. J. David Hernandez Chacon. Although there are bunch of talented modellers on this project this fellow‘s concept fits in totally with his look. I have been enamoured with his projects before so I was looking forward to seeing more of this book and what it could teach me. I got to reading, and now I’ll take you through the book as it is written and explore some of the chapters. Each of the articles in this book make up a short introduction, with a step by step (SBS) build running thru the rest of the article, one picture to a caption, usually a paragraph. The nature of learning like this is an immediate understanding of what is going on without having to go back and forth from block text to captions to advance the story. The layout is simple and logical. We noticed by just looking at the contents page that there are five main places visited in the book, and through these theatres of differing climates the nine main chapters in the book, with several smaller sections in these chapters focussing on creating the flora used in the scene/ diorama are examined. First, we go to the western desert. The opening chapter sees us travel to Tunisia, where the German forces were fighting a desperate battle to remain on the continent against the British, U.S. and allied troops of various nations. The main scenery to be replicated is brought about in a diorama that is called “Rommel in Tunisia” and guess who is the star of this propaganda reel? Yes, Erwin Rommel and some of his underlings are inspecting a captured Stuart tank. This scene just does not happen, someone has to create the base, flora, soldiers and the vehicles. The book slips into a step by step (SBS) process after this. All of these stories are pretty much told in the same way, with a clear picture of the step and then a few sentences describing the action beside it – I like modelling books like this. They isolate exactly what is going on and what is in the modeller’s mind and allow you to better understand the process. We look at the diorama literally from the base up. The use of a roughed up cork base with many types of pebbles I thought no one could make look scale realistic. The modeller shows us how to make large boulders with plaster and putty materials, how to paint them to seem like they are actually a Wadi (a dried up river bed) and then how to add the flora to make this look like something other than the surface of Mars. The modeller then shows us how he decorates the Wadi with more than small vegetation. Making large palm trees are shown in a “how to” section that includes the use of Eduard photo etched leaves and how to shape and paint them. The lovely dio is shown from a few different viewpoints for you to absorb more of the model. These Tunisian palm trees, the dio base, and plants already have us forty-five pages into the book and we are noticing already that this book is just concentrating on what it says on the cover “Hyperrealism in Natur” – and not the figures or military vehicles. We can already see that this book is specializing in the Flora and Terra firms it grows on. Next, we look at the highlighting of a non-static type of nature with the look of a slight rocky slope with the addition of a small bubbling brook of fast running water next to a tank destroyer on a diorama base. This water adds more of a dynamic and maybe a more “alive” aspect to this diorama that otherwise would just house a Hetzer tank destroyer without even a turret or figure to create some interest in the scene. The rocky and dead wood strewn base is seen again from the very start to finish. Again we are lucky enough to get a little expose of reference pictures to give you some idea of both what was in the modeller’s mind but also some ready-made shots for your own project. The Ardennes, more specifically the Hurtgen Forest is a much-modelled scene for modellers and the coldest winter in many years at the time of this diorama’s creation is seen with the help of micro balls, fake model snow and still water. There are a few products used to also create the flowing icy water and the dormant trees. The reference pictures of snowy icy water will help many a modeller who has no snow within their regular travels – global warming and all that! We also look at the Ardennes before the winter and the “Battle of the Bulge.” The scenes of autumn and the dying, colourful vegetation complement the base what is again shown in conception and construction from the start to the finish, topped off with a long barrelled Sherman in place on top of the scene. The low groundwork is shown in creation as well as things like the power or telephone lines next to the road, bolts and contacts included. Everything that is from nature is shown in this book. It’s very focused on just that aspect and I like that. We are still in the Hurtgen forest in the next section. It features some US GI’s taking cover in a heavily vegetated and wooded part of the forest before the winter hit in Autumn. This part of the first is especially colourful. You do not see so many dioramas like this that really concentrate on the flora, but this one with coloured toadstools, dead and dying leaves, a gnarled tree and the layers of flora needed to recreate real life are shown in this chapter. Again we have a picture walkaround of thick oak trees and mushrooms/ toadstools in the forest. In an almost opposing scene, we then travel to white Russia – Belarus to be exact, although it could be any forest in central Europe. This section of the book has many different flora aspects to it that are shown in detail yet again by the author and modeller. We see the stream that the German soldiers are walking through from the base to the rocks, water, and moss that they are both walking on and in. The step by step method is a great way to learn how to replicate this on your own model. Everything you would expect to be in a stream is shown, with some references to the first book in which some of these elements are shown. Handily all that you need is shown in this or other parts of this book. The ever handy picture references are shown here in this book also. We see how to detail trees with Ivy. Something that is very present in forests without direct sun like the ones in Northern and Central Europe. The roots of this creeping plant are shown in detail and just how to make them on both walls and trees and interestingly how they filling holes in nature, tracing their way to the sun. We are also shown how to recreate the creeping plant and weeds in a realistic fashion. The other large bit of flora we see in forests and greenbelts are ferns. Usually depicted in shaded areas in dioramas they are “naturally” going to be shown in this book. We get a how-to in pages of not just only fresh green ferns but also yellow and red ferns in different states of growing and decline with the inclusion of several pictures of the real thing in all of the states shown in the model making section. The last major section is a replication of the Bocage in Normandy at the time of the D-Day invasion of 1944. This dio sees two Germans walking down a road in the Bocage with water flowing through their footsteps and brushes and leaves blocking every way of sight to them. This section of the book again starts from the base and literally the groundwork of the soil and dirt through to the smaller layers of the rocks, grass and small shrubs as well as the inclusion again of a small flowing brook. Some of the previous parts of this book are coming together in this chapter. The book then shows us in several diagrams about the Bocage and how it grows to help you understand what you are creating here. The ever included reference pictures of the Bocage flora are also here. A helpful index tops off this large book. This book is not for someone who wants to learn how to model tanks or aircraft or figures. It is for those of us who want to create a nature scene that is completely believable. The thing is, nearly all of the scenes with tanks, aircraft or figures HAVE nature in them. So really it’s for every modeller – unless you want to model a submarine or an aircraft carrier this book will be of help to you. A great comparison to the first book in this series and an effort that eclipses that book in its size and scope but matches it in a passion of making great natural scenes. This is one of the first books you should get if you want to model anything on the surface of this earth. It’s really a great book in your arsenal.